The great interweb tells us we can get a boat from Bandar Abbas in Iran to Sharjah (Dubai, UAE)… good news… let’s give it a whirl. One phone call (via yet another Iranian friend) reveals Mondays and Wednesdays at 7pm – A schedule! – this is promising; we rush to Bandar Abbas. Monday morning. The Travel agents. Hot and steamy in Bandar, I step into the cool of the travel agency, spying a promising ‘ship to sharjah’ sign, I head to the counter. This is too easy… I’m thinking. ‘Just bring your passport’ the glossy eyed agent clips, ‘and we’ll give you a ticket’. 5 minutes later, I’m back, two slightly warn passports clasped tightly in my sweaty palm – all present and correct. I present. Glossy eyes blinks – ‘No boat, it’s cancelled’. Her detached typing taps out the seconds as I wait for an explanation – ‘um..’ I cough… Her fingers waver.. she sighs.. ‘Maybe it will come tomorrow or maybe not’. She resumes her tapping. Pointedly. To make myself feel better I go through the process with another travel agent – story stacks up (ish) – boat tonight is cancelled. Next boat leaves on Wednesday. Resigned to a few days in Bandar we wash some pants. As the evening draws in Catherine suggests – ‘let’s just ask again about that maybe boat, before the travel agents close’. So we do. ‘Oh yes it’s going tomorrow at 10am’ chirps a rare breed – it appears we have stumbled upon the lesser spotted helpful travel agent. ‘Splendid! Can I get a ticket?’ I ask. ‘No, but maybe try the Travel Agency next door’ they tell me. I go there, and have a near heart attack when the lady tells me the boat is leaving tonight in about an hour and a half…. after a couple of heart in mouth minutes it turns out she is wrong. I am right; the boat is in fact going tomorrow morning – with relief that we haven’t missed it I ask for a ticket… ‘No, get it at the port tomorrow. Boat leaves at 10am, get there for 7 to get your ticket’. I panic my way back to the hotel, pack up our bags, change more money – unsure now of the price having been told anything from$75 – $140 – plus the cost of bikes… and we never know what that might be. While at the same time nurse Queen Catherine who has been dictating from the hotel bed while nursing a twisted ankle after surviving a particularly aggressive altercation with a pile of sand and medium high kerb (ahem), and generally flapping about with ice and makeshift bandages – I knew that dodgy fruit salad head scarf would come in handy! Tuesday morning. 6.45am – The Port. … Things are looking good, there’s a queue of people with lots of bags and stuff. It looks like other people think there’s a boat too! We are ushered to the front of the queue and are reassured that we will be able to get our tickets from the Captain of the boat. Until the Captain of the boat arrives – ‘Tickets? From me? No can do. Try the Travel agent’. Helpfully they package me into a taxi to try yet another travel agency.. my 5th so far. Two women, one who speaks English are bundled into the taxi with me…. it turns out they are at the port to see off their sister who lives in Dubai and visits once a year – I feel terrible – as I am a raw nerve and there is no fun conversation to be had in my jagged state. After 57 mins of general huffery the agent finally grunts ‘No ticket, the system is down’. She snaps me a glance of accusation. Clearly it is my fault. As crestfallen as a wilted three week old sprout I slump in the taxi and return to the port. It’s been an hour and a half, the boat leaves in 30 minutes, I expect to see movement and action, an empty departure lounge, weeping relatives……Nothing has changed. More people have gathered with a whole lot more things to get on the boat. The queue stands. But, maybe things have changed… the boat itself is actually here in the port (good news) and Catherine has made friends with a group of German bikers and jeep drivers. By some conspiracy of Iranianism the German bikers come with a German speaking Iranian angel, in the form of a bloke who happened to be staying at their hotel and offered to help them. The angel then spent 2 days sorting out a heap of beaucracy for them so that they can get their motorbikes on this boat. He is enlisted … and strides off to speak to some officials somewhere on our behalf. He returns, through German, English and Farsi … shafts of hope are revealed. There is space on the boat (it is about one third full), but as the web based system is down it is not possible to enter our names into the computer and therefore we cannot get a ticket, without a ticket we cannot board the boat. But…. There is a list. We are now on it. The Golden List of Hope. It feels touch and go for the next 3 hours and without the angel I can assure you Catherine and I would have given up and gone to buy a ticket for the next boat. But instead we wait, with everyone else. Some checking-in starts to happen – the luggage bypasses the expensive looking bag scanners, to be stared at by the 8 officialish men languidly gathered around one check in desk. Dust the only thing gathering at the other two. Then lunch is called. Everything stops. Everyone eats –a free meal is laid on. It is now 12.30pm. After that lunch for the military police (not before they’ve participated in some good loud praying – for our benefit reckons the angel) then lunch for other staff. As far as we can tell, during the eating nothing else progresses. A couple of the Germans then get hauled off for a sequence of 30 minute interrogations about where they’ve been and what they’ve been doing. Fortunately (probably because we’re female) we miss this. And finally, having been in the port building for 7 hours, we are issued with some tickets. There is still the issue of our bikes… a price is asked for, then withdrawn. We wait a further 45 minutes after which the original price is once more asked for. Throughout all of these schenanigans with the Europeans (in total there are 10 of us, Brits, Austrians and Germans) all the rest of the passengers have boarded. Hours ago. Eventually our passports are returned to us, they’ve been with the officials for about 3 hours. We are told to board. There’s a whole lot of toing and froing to do with loading cargo (all three cars, 5 bikes and two bicycles of it) – why it had to wait until after all the passengers were on we will never know… but eventually around 5pm (22 hours after scheduled departure) the boat FINALLY departs…. we cheer, we whoop, we holler (the Germans clap). Still bound in our headscarves (the boat is Iranian territory apparently) we endure the not too arduous 12 hour journey – it should take 8-9. It docks in Dubai at 5am.. but customs doesn’t open until 8…. we wait some more. Eventually a dog is let loose to skip over our bikes playing for drugs, we get shuffled from one incomprehensible queue to the next, we watch Hannibal lector rip someone’s face off (the while-you-wait-movie), we undertake one precarious ride across a very oily dock until we are set free – to face the 10 lane super highway from Sharjah into Dubai…. 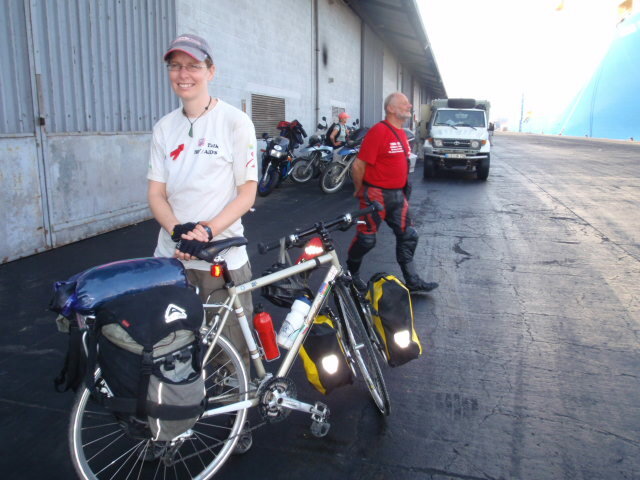 we acquiesce and get into a taxi with our bikes – this is the most dangerous place yet!! And so ends Iran (maybe). We have arrived on the Persian Gulf. We swelter. We have been weaving our way through the endless dry brown of central Iran for the past 30 days to finally be unceremoniously spat out on the glittering coast – the ubiquitous black blobs that shadow over the rest of Iran now replaced by peeks of silver and gold trim dancing on the ends of piercing purples, pinks and oranges of Indian salwar kameez; the men darker, thinner and decidedly more 70’s in their helmet-esq crowing hair doos, tight flared trousers and broad collared shirts sticking to them in the wet heat. Surely we will miss Iran. If we ever leave.. which is by no means assured. We were hoping to catch a night ferry to Dubai this evening but 5 minutes after confirming us a place, the boat has been cancelled.. maybe.. or maybe it will still go.. maybe tomorrow morning at 7am.. can we get a ticket for that?.. *shrug* maybe. So we sit. And swelter. Iran has been… complicated. Unfailing in its hospitality, unwavering in its interest, undeniable in its outstanding rugged sexiness. It promised nothing and delivered everything – if you ever dream of Istanbul then really you are dreaming of Esfahan. Nowhere have I ever been in my life where the people have been so genuinely interested in talking to me (more fool them! ), more honest in their critique of their own situation (albeit in hushed edgy tones) and more realistic about their place in the world. Nowhere have I ever been so helped or so welcomed – everywhere and in the middle of nowhere; from the pomegranate farmer who took us in for the night and stocked us up with eggs and bread for the next day, to the truck drivers who use their trucks of give us protection as we try to cross turnings on busy roads or fill our water bottles when we are getting low; to the many people who have given their time to lead us to whatever rough and ready bit of lodgings may be available, or offer us a safe patch of ground for our tent. And never have I had so many free lunches and free cups of tea. But never have I been to a country that has been riddled with so much fear. The paranoia of American Radical Feminism would have a lot in common with the gender narrative here.. all men are potential rapists and never to be trusted – who knows what lewdness their uncovered legs might lead too? As one women told us .. ‘ the evil eye is everywhere’ .. this is why she chooses to wear the chador. The tent. And there is an undeniable hunger in the eyes of some men we have come across; everywhere we go we are followed by calls of ‘Hey Missus – I love you’, and the giggling harassment of pea-cocking young men is wearing. But so is the inevitable sadness of it. As one man explained to us – ‘it’s like water, if you live in an oasis you don’t think about it, you can take a sip or not.. It’s up to you. But the minute you are in a desert it becomes all you think about and all you crave’. 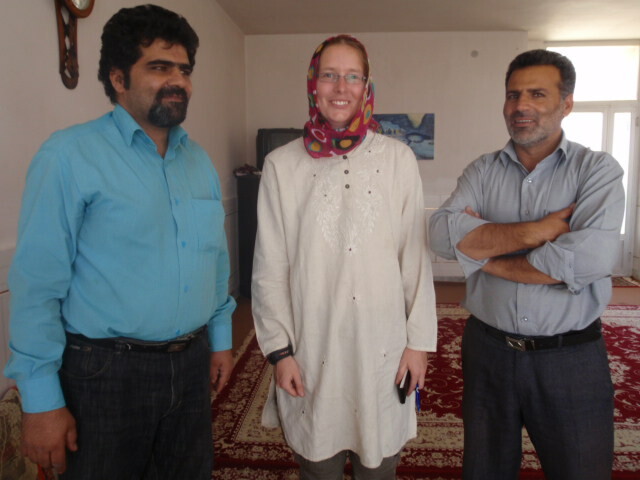 One of our more surreal experiences in Iran was being interviewed for Iranian TV, a culture programme, we were told. It started with the usual questions about why we were doing this journey (a great opportunity to mention HIV/AIDS – fingers crossed it didn’t get lost in translation, we have full faith in our translator, a slightly bewildered local shop keeper drafted in for the afternoon…. 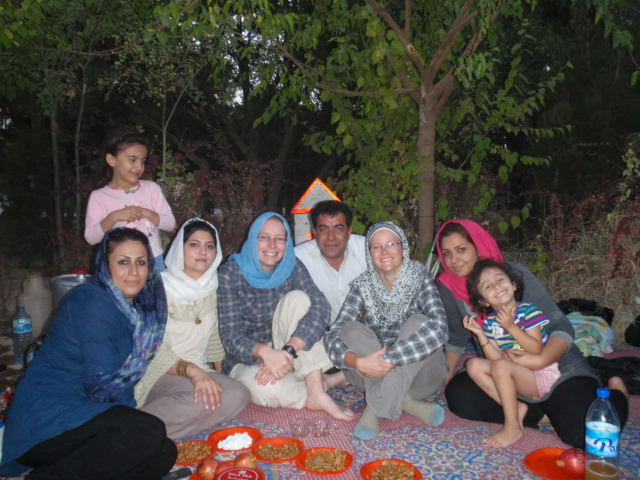 ), where we had cycled, what we had seen etc But then it started to focus more on the Iranian family.. What was our experience of the Iranian family? Which was better families in Englistan or Iran? Aren’t Iranian families stronger than those in Europe? .. as we tried our best to tactfully tiptoe our way through the growing Political mine field we had just been plopped into we began to suspect we were taking part in an anti-western propaganda film! Though to be fair I haven’t yet seen an hour go by on Iranian TV that isn’t flanked by some news strap about the evil US or the marauding Zionists. So maybe it wasall just par for the Government sanctions course. Sadly then, goodbye Iran. Hello….. the next bit… whatever happened to our straight route to Thailand? We appear to be heading south….next stop Oz??? We are making some really good, really hard progress, please remember that it is never too late to sponsor us (all the pings go to two really super charities) and please encourage others to sponsor us and follow our blogs! We had 30 days and a huge country to think about getting across. We began thinking we were heading west, towards Pakistan – but this changed as we were unable to get a visa (coupled with increasing numbers of bombs going off throughout Pakistan). 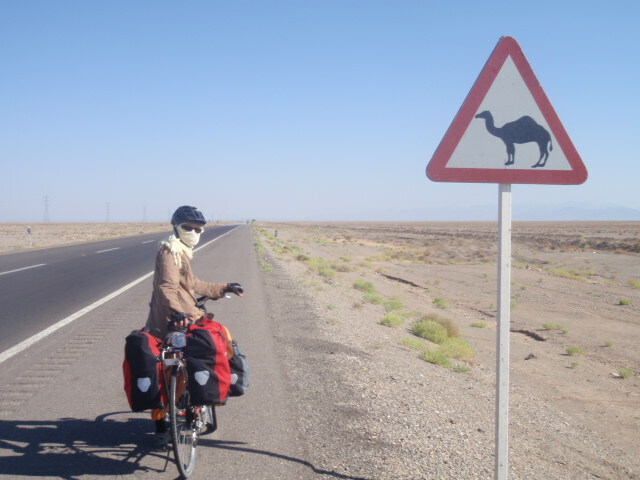 We scoured the web looking for known/safe cycling routes in Iran and there seemed to be a few that kept cropping up; Esfahan to Yazd, Yazd to Shiraz and Yazd to Mashad (across the desert). Esfahan to Shiraz tied in nicely with our plans to head to the south/south east of Iran. We began our Iranian cycling along the Caspian coast, from Astara to Rasht – the friendliest road we cycled (the kind of road where people are just doing day to day business rather than long trips) with food and drink handed to us from cars along the way. The road was busy and narrow (no hard shoulder) and the sea itself was nowhere to be seen. There are 2 hotels in Talesh (aka Hatspar) – we stayed in the first one, it was crap – try the other one – it’s a couple of minutes further on. 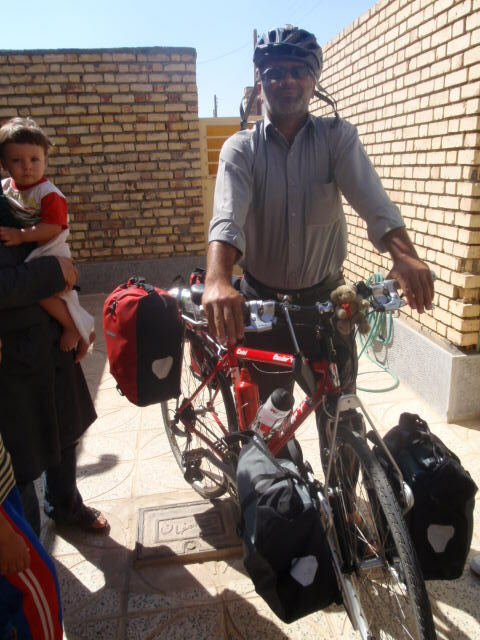 Used to cycling in hejab and having built up some miles, we headed to the centre (by bus) to Esfahan, preferable to cycling the Rasht to Qavzin highway (a renowned death trap). 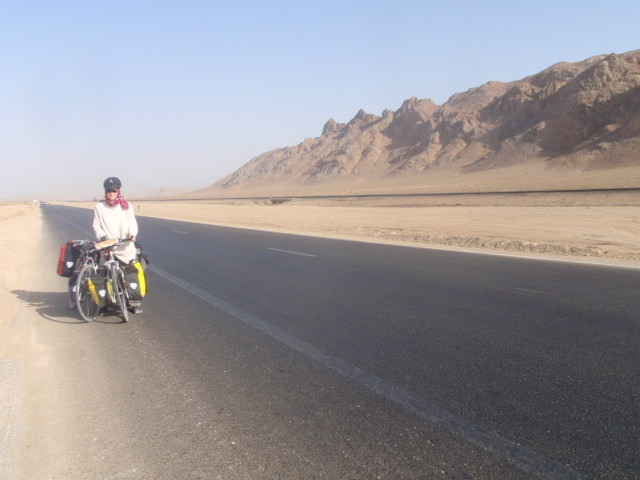 The route from Esfahan to Yazd proved to be unpleasant, with heavy truck traffic the whole way. Highlights on this 4 day, 320km route included staying at a nice homestay in Toudeshk, being invited for lunch in Kupaye and camping under the stars between Na’in and Ardakan. We found a cheap hostel (mosafferkhaneh) in Ardakan. Overall we wouldn’t recommend this route, unless you are on a serious A to B grunt run, save your lungs for somewhere quieter. A lovely rest in Yazd and we hit the road again heading to Shiraz, via Abarku, Sadat Shar and Persopolis. Once beyond Taft the truck traffic reduced and the road dropped to single lane, riding up the hill was pleasant, especially as the heat of the desert drops away. If you have a bike problem – Yakoob (no.2 Iranian mountain bike champion) has a bike shop in Taft (ask in Taft) – he joined us on the road for a pleasant day of riding. Following some routes from the net, we expected good wild camp opportunities at the summit, unfortunately there was a lot of road works going on, with road workers sleeping on the roads near to where we planned to camp – being two women this made us feel uncomfortable – so we pressed on to Dier Shur, hoping to be able to camp behind the police station – no such luck, they were having none of it, again as two women this was a no no. The road from Dier Shur to Abarku was lovely – desert, dual carriageway, hard shoulder, light traffic. There is a hotel in Abarku (we didn’t stay – but wished we had). From Abarku the road narrows to single lane and is heavy with truck traffic (although a new road is being built – so we found some respite on that). At Surmaq we had heard about an Iranian cyclist tourist catcher… perhaps he was out, perhaps he’s moved on… but the ‘welcome’ is no longer painted on the door. The hotel in Surmaq is SCABBY and extortionate – don’t stay there (in our opinion). From Surmaq it’s onto a main autobahn and a long, long climb. Fortunately at the top there is a lovely Red Crescent post with water, toilets etc (super!). Emotionally crushed by the smog clogged road and needing to get to Tehran to sort visas we picked up a bus from Safar Shah to Persopolis. 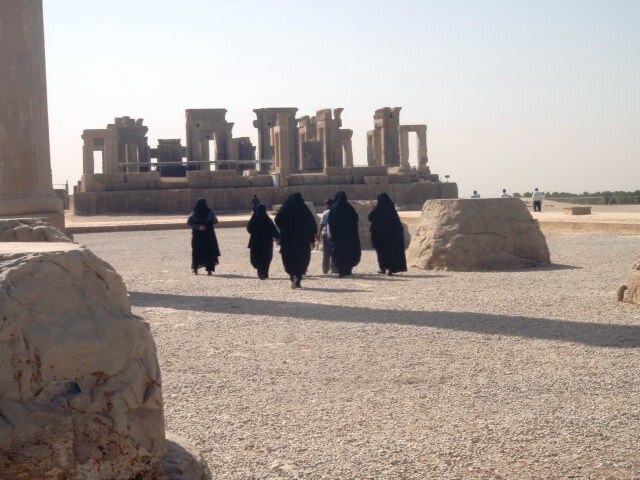 The ride in from Persopolis to Shiraz was ok – but still the autobahn. Visa decisions made and heading south towards Bandar Abbas we picked up where we left off at Safar Shah. Safar Shah to Sirjan off the beaten track, but much more pleasant! Bavanat valley is a beautiful ride, quiet road, stunning views, green(!). We stayed in Bazm (lonely planet) – food was great, but the whole experience was overpriced – he’s targeting tour groups with money – the nomad tour was thin and the trinkets given unnecessary – plus the beds were hard and thank god we had our sleeping bags! Dropping out of the mountains and into the desert the road gets busier, but nowhere as bad as anything else we’ve seen in Iran – it’s long and straight and with a rear view mirror easy to see the trucks coming and move off if they can’t pass safely. 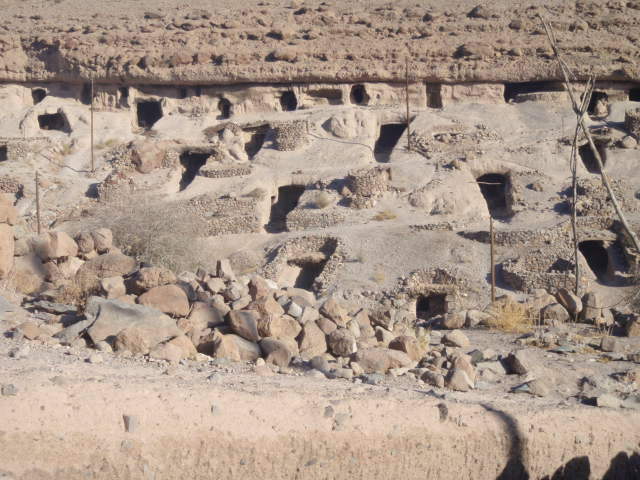 We found cheap accommodation in Harat and Shar-e-babak (just ask for otagh (accommodation), rather than a hotel – and as it’s Iran someone will lead you there!). The ride from Shar-e-babak to Meymand was a stunning, uphill, very worthwhile detour – we would recommend staying in a 2,000 year old cave eating lovely (simple) local food. From Meymand a splendid downhill run leads you back to the main road, which is flat, surprisingly quiet and with a great hard shoulder the whole 60k way to Sirjan. To get out before our visas expire we jumped on a bus to Bandar Abbas – as the bus wound its way up steep mountain passes we were extremely relieved not to be on our bikes – the truck traffic to/from Bandar up these narrow, dangerous roads is gargantuan. PS –we would recommend you ALWAYS wear a red HIV awareness badge as it’s a super conversation piece! PPS – hope you have all been following Mee Nooi! After its controversial nuclear aspirations, having the highest road fatality rate in the world, being a global nose job hub, Iran is also famous for its carpets. Carpet browsing in Iran has been a delight. Allowing yourself to be bustled into the small enclosed carpet dealers shop, engaging in seemingly casual small talk – knowing full well it’s a gentle game of assessment; is this your first time in a carpet shop? (knowledge), where are you staying? (budget) what job do you do? (capital). Accepting the tea offered, waiting for the stories to begin. Because a good carpet seller is selling you a story, that is what a carpet is – a story, the grain of someone else’s life. 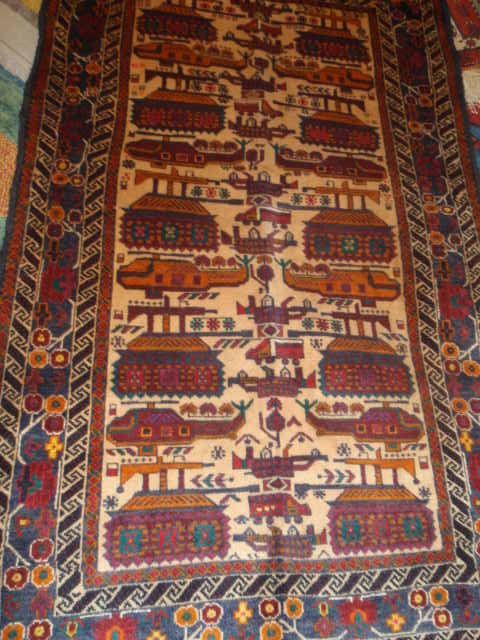 There are approx 2 million nomads living in Iran and many of them make carpets that (once the nomad has finished with them) form the basis of much of the carpet trade in Iran. There are many different types of carpet but basically they fall into two main camps, machine made or hand woven, and those created from a symmetrical pattern or those woven from the imagination of the weaver – the latter type is the main domain of the nomads and (to our minds) the most interesting and evocative. The images and patterns swirl into each piece telling the tale of the seasons, the lineage, the history or the simple daily life experience of the weaver. But a carpet transaction isn’t just about the weaver, buying a carpet sits at the intersection between the weaver and you (or in our case ‘us’). A story passes on, a new story continued. And so our carpet journey has threaded its way through our travels in Iran. And after much tea drinking, much debate, many financial reality checks, and many many many carpet shops browsed we stumbled upon our stories. We found two carpets. The first is a war carpet. Once you get over the boy’s bedroomness of them, war carpets hang as torn moments in history. They are the scars of conflict and tell of the daily experience of the weaver – the images woven are of tanks, guns, and fighter jets. They bear witness to jagged moments of bloodshed the ongoing existence of which has also shaped our journey and its course. There were also keen echoes of the iconic HIV/AIDS quilts that trumpet the diseases legacy around the world. The one we found originates (maybe) in the Mashhad region of Iran, this region borders Afghanistan and it probably references the Soviet invasion in 1980’s. 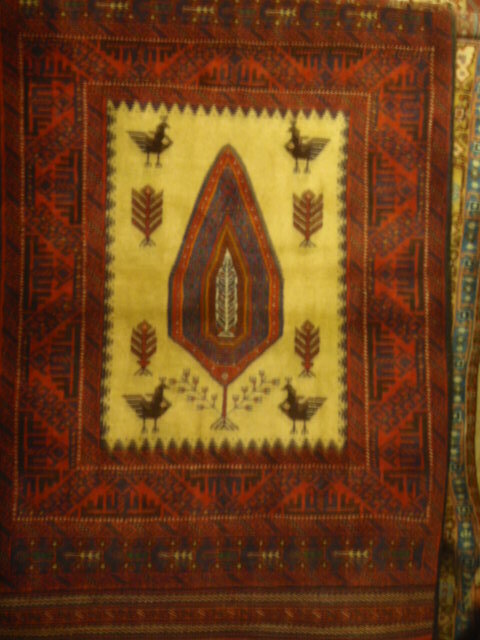 The second is a marriage carpet. The symbolism is simple. The two birds depicted face each other as a sign of their union, the tree in the centre is the tree of life. The carpet transcends gender and speaks simply of love, hope and the joining of two lives. So, if you are thinking of coming to Iran, and you a thinking of buying a carpet, take your time, be firm with your finances, drink the tea, play the game and wait for your story to find you. ‘We have a farm. Please, come and stay with us’ rumbles Makmood from the passenger seat of his crumbling, smog churning Paykan, ‘No argument!’ He is an old man, he has a bad back, he carries a stick, and his English is good. His wife is driving, she is wearing a short head scarf and light coloured manteau. She smiles. It is dark. We have been cycling all day through the desert, we had a puncture, we climbed a hill, and we haven’t found a decent camp site – the road is full of work teams – they sleep on the road at night. We have noticed some watching us as we search for a pitch – their eyes hard to read. We have been forced to cycle further and further to try and find a safe place to sleep. Finally we arrive at a small dusty town, we have heard that other cyclists have been able to camp by the police station, we ask the guards. They say no. That is when Makmood and Afareen reverse down the road to offer help. Our options are limited. Trust is the best option we have. They say that they live 7 km back up the hill. Liz looks like she might cry. Makmood decides we should leave our bikes with the police and go with them in their car. We do. Assessing risk is a complicated business. Who are these people whose car we are in? Where are they taking us as we allow ourselves to be driven off into the dark Iranian night? Can we trust the police to look after our bikes? Should we have camped? Why didn’t we? The truth is that there is no ‘safe’ option in these situations, there are only risk assessments. But we can hope and we can trust. It is easy to see how spirituality can be enhanced on these kinds of journeys… what fate to be ‘rescued’ at a moment of crisis, how biblical to ‘not be afraid’, how optimistic to believe in the ‘kindness of strangers’. These things are easy to believe in when things go well. But what do they say about the times when things don’t? What we do is pull on safety indicators… he is old, she is dressed liberally (for an Iranian), the police know where we are, his English is good – it turns out he has lived in America for some years. She is driving. These are good indicators and are better providence than taking a risk on camping. Which we didn’t do. As it turns out Makmood and Afareen owned an idyllic pomegranate and pistachio farm out in the rusty desert. They gave us their guest bungalow and invited us into their home to share stories and snippets of our lives. They told us of Iran and the revolution, they told us about their qanat water supply system, they told us about the three year drought that devastated the crops, they told us about the clawing summers and the pinching winters. They told us they like to horse ride but that it is hard with Makmood’s bad back and the high cost of keeping stock. 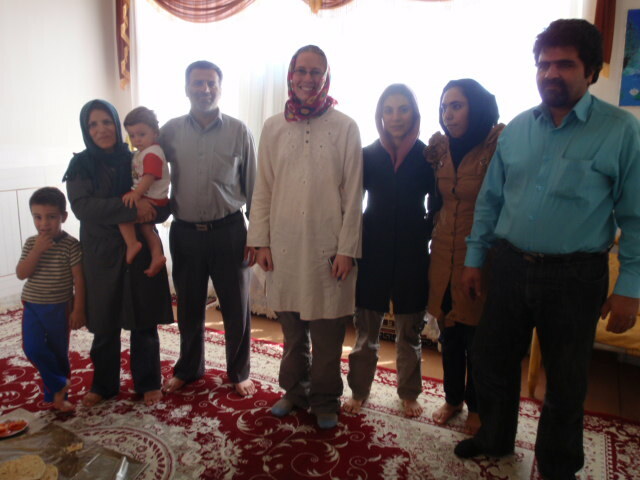 They told us about their concerns for their children and their hopes that they will be able to find jobs. And, as their little kitten was falling asleep on Catherine’s lap, and Catherine looked like she might follow it, they told us to go to bed. Which we did. Safely. According to the Tehran Times there have been 6 bomb blasts in the Pakistan city of Quetta this week alone. The Pakistani authorities have closed one of the southern land borders. Quetta is a key transit point for us in Pakistan. The British FO has been trying to support our trip, to keep it overland, but even with their support it may take up to 3 months to get a Pakistan visa. There was another blast in Karachi yesterday. Sometimes it can be hard to sniff out real risk from beneath the stench of our own fear and the waves of others – this time it isn’t. Pakistan is too great a risk. So. 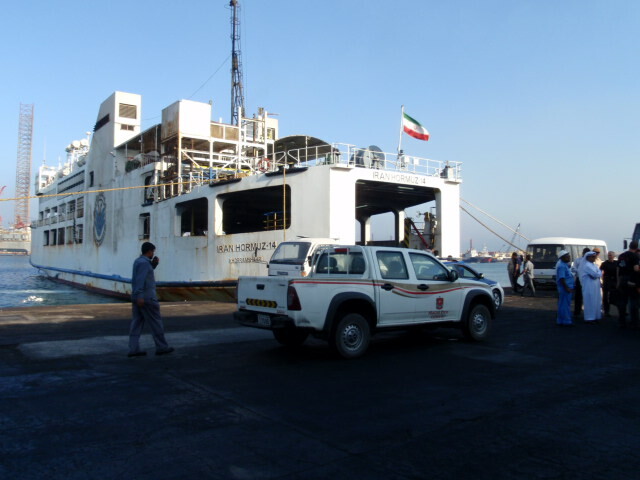 From here we head south to Bandar e Abbas to catch a boat to the UAE… from there… who knows how we will get to India! Ta’arof is tricky. How many times is it polite to say no before you are sure that the offer is genuine? Ta’arof is a system that a)allows a person to be polite and offer you something e.g. a meal and b) to be allowed to back out of it without losing face if they can’t actually afford it. For example – when in a restaurant and you go to pay, the owner may shake their head and indicate that it is free. This is not the point that you whoop hooray and bolt for the door; this is where ta’arof begins. Your role is to keep insisting until they relent and tell you the price; only if you have insisted a number of times and they have refused to tell you, a number of times, can you be sure that it really is for free… you hope. This is very complicated for us. We are painful in our need to ‘not cause offence’, bum shrivelling in our reluctance to ‘be a bother’, and heavy handed in our ta’arof. ‘Please come and eat with us’ Ali motions; his wife Razieh beaming broadly from under her chador eagerly nods her encouragement. ‘Thank you, but we have only stopped for water and must be on our way’ Liz gestures back. Both of us begin the obligatory ritual of bobbing and cooing our ‘thanks-but-no-thanks’. ‘Please please’ they insist, ‘Hot!’ he puffs and fans himself into a mock faint with comic exaggeration. In the middle of the Iranian desert, in the small, brown, nondescript village of Khupaye, we have found the jolly Iranian giant. A broad faced man, unfazed by our joint communication ‘lack’, with an unrelenting buoyancy that would make a St Bernard puppy seem positively lack lustre, is Ali, and he is insistent. But we are equally insistent in our refusal (isn’t this what we are supposed to do?) Ali seems to back off. But this is a cunning ploy to regroup – he returns literally seconds later with a small child gripped to his great chest, being shadowed by another, easily miss-able in the great wash of Ali’s wake. He thrusts the reluctant smallness forward, said smallness falters only briefly in the face of our absurd foreignness before remembering his job and we are duly presented with lunch. Ali has brought lunch out to us. We flounder, are we supposed to say no to this as well?!!! This is complicated. We reach for it. But no! It is snatched back… ‘Where will you eat this lunch?’ Ali grins slyly ‘our house is only here, come come!’ Then the whole family appears, a swirl of black chador, and great tidal smiles pull us in. We have been captured! Iranian houses are big and bare. The floors of the main communal space are carpeted with large Iranian rugs; bolsters and cushions line the walls. ‘Relax, relax’ Ali motions, he fusses us down and makes much of Catherine’s mismatched socks. Who would have thought that a much maligned personal habit could act as such a perfect cross cultural ice breaker! Razieh joins us, without chador or head scarf she appears every bit the practical ‘mom’, with jeans and workaday t-shirt, she pulls baby Mohammed in and feeds him. Between women there is no need for reserve or restriction. To Ali we are honorary men, to Razieh we are simply women. It is a marked transformation that is swept up in the rush to try and learn about each other’s lives. Between our scant Farsi phrases and their non-existent English we managed to pad out a surprisingly great deal about each other’s lives. The magic letter helps. Once our limits have been reached Ali calls upon Uncle Mohammed. Who arrives so quickly we suspect he may live on the porch! Uncle Mohammed bring his daughter who retreats to the kitchen with Ali’s elder daughter (they fuss about from room to room, shyly catching our gaze as they pass and returning our smiles – but never stopping and never joining in). The new arrivals prompt a costume change in Razieh. It seems that she has a spare chador or manteau and scarf in every room, so that changes in social etiquette can be seamlessly catered for. And thus she folds back into the fabric of the room. Lunch is ready. The women lay out a mat on the floor for us to gather around – by “us” I mean the “boys”. The women do not join us. ‘What wonderful food’ we mime, ‘what is it?’ – the meal was unleavened bread, tomatoes, and deliciously soft patties of some sort. Uncle Mohammed tries to mime the animal in pattie-question but, despite 10 out of 10 for effort, and bar it clearly not being chicken, his illustration lacked the clarity needed to aid identification – it was, we concluded, a lumbering something. ‘Great!’ we smiled. At that point his daughter scurried past on yet another unidentifiable a-to-b mission and slipped a quiet ‘camel’ into our ears. ‘Camel!’ we exclaim ‘Yes! yes!’ Uncle Mohammed puffing in delight at the apparent crispness of his charade. Two mysteries revealed. Camel burgers for lunch and an uncalled upon daughter who clearly spoke more English than anyone else in the room.